Occasionally I take a jaunt into a different technique. I played around bead crochet, tried bead crochet ropes, but found them to require too much time loading beads, plus I like the fiber to show. In April I took a class with Julie Goodenough - Read the blog entry about the class. Since then I added single bead crochet to my repertory. Of course I had to personalize the single bead crochet multiple cords with knotting and cordmaking. This piece evokes a fisherman pulling his net full of turquoise from the bottom of the sea. 30mm Chinese turquoise donut. 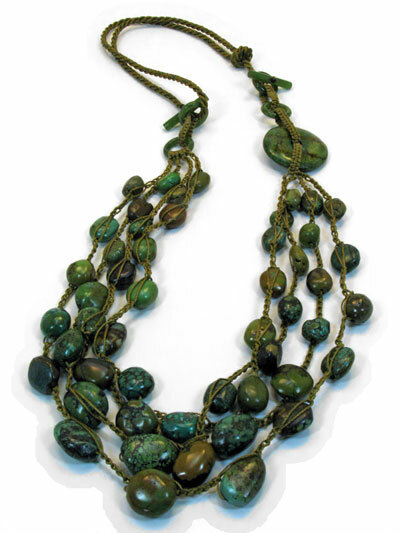 Green Chinese turquoise nuggets. Jade rings and toggles. Nylon cord.